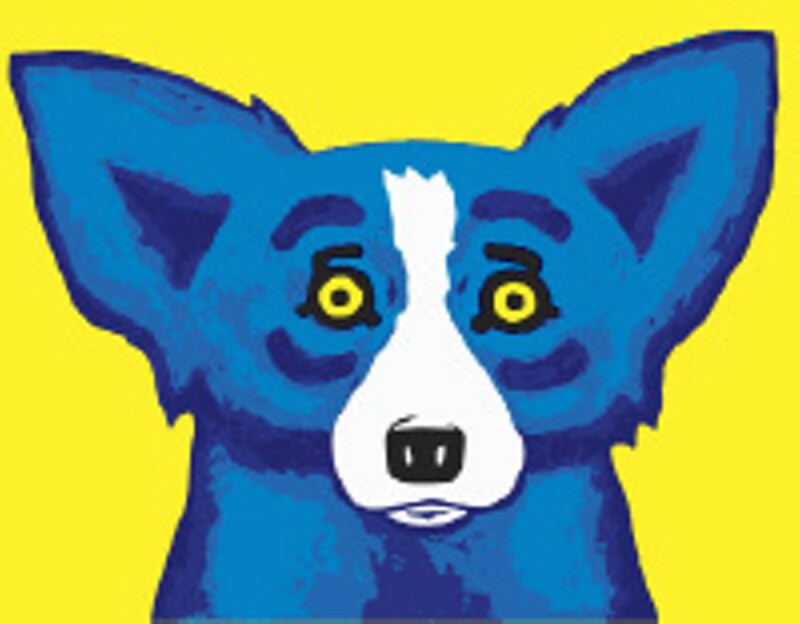 George Rodrigue brings his Blue Dog to the Dixon. It's hard to imagine a world without Blue Dog. George Rodrigue, a Louisiana native, began painting the canine, originally an homage to the loup-garou of Cajun myth, two decades ago, but it feels like the blue-and-white dog has been around forever. Born in New Iberia, in the heart of Cajun country, Rodrigue attended the University of Southwest Louisiana and studied abstract expressionism at the Art Center College of Design in Los Angeles before ultimately settling in New Orleans. "Back then, art in Louisiana was everybody trying to copy what was coming out of New York," he explains. "After my third or fourth trip away, I'd started realizing that Louisiana was very different from the rest of the country. I started documenting every facet of life that was pictorial. Cajun music was in a revival, there were crawfish and gumbo festivals, and I found a wealth of information right there to photograph." Using those images as source material, in the 1970s, Rodrigue began creating a body of work that depicted outdoor dinners under giant live oaks, Mardi Gras royalty, crawfish boils, and afternoon hayrides. Then he moved onto Louisiana's homegrown heroes and folk legends: Evangeline, Huey Long, Paul Prudhomme, and, of course, the loup-garou or werewolf. "I wanted to graphically interpret the history of the Cajun people, who were cut out of Canada, came to Louisiana, and stayed there," Rodrigue says, referring to the Acadian exiles of the mid-1700s. "I wanted the people to look cut out, so I made them with sharp edges and used white to show how their inner culture was glowing. It took about five years to really get it down, but the more I came up with the formula, the more unique my paintings became." Rodrigue hung 25 of his creations in his gallery window when the Super Bowl came to New Orleans in 1989. "And that was it," he says triumphantly, noting that within a week, People, The Wall Street Journal, The New York Times, and the Today show, had catapulted his $800 paintings into the national consciousness. "I got a better reaction the further away [from Louisiana] I'd go," Rodrigue says of his work, which by the mid-'80s, had begun to feature Blue Dog, modeled on photos of his own pet, Tiffany, who died at the start of the decade. Through the '90s, Blue Dog appeared in hundreds of paintings, sharing the canvas with Louis Armstrong, Billy the Kid, and an alligator. Blue Dog wore clown makeup, Mardi Gras masks, and an Abe Lincoln stovepipe hat. Blue Dog also turned up in unexpected places, sitting on cemetery crypts, in front of the White House, and on picnic blankets with Rubenesque nudes. Painting Blue Dog is freeing, Rodrigue says. "It's all about shape, colors, and patterns. I was ready for it, really energized to try something new and different and really contemporary. After I painted 100 of 'em, it became a purely emotional exercise." Although Rodrigue has accepted commissions for Xerox and Absolut advertisements, he refuses to mass-market Blue Dog, turning his back on what's potentially a multimillion-dollar industry. "Everybody says make T-shirts, do this, do that, but it's not fun for me. I won't make keychains or icebox magnets. If I did, I'd have to quit painting, because it would no longer be a creative process." There are also the fans who wear homemade Blue Dog souvenirs. "Doing something that's so popular is sometimes a double-edged sword," Rodrigue says with a chuckle. "We've gone places where somebody's sitting there with a Blue Dog T-shirt, one that they've downloaded and ironed on. We've got five lawyers working all the time, stopping people from making Blue Dog stuff and selling it on eBay." "Mass merchandising," he decrees, "is for my kids and grandkids to do, but not while I'm alive." Although the bulk of the paintings that comprise "Blue Dog: The Art of George Rodrigue," which opens at the Dixon Gallery and Gardens this weekend, centers around Blue Dog, the exhibit also includes early pieces and samples from Rodrigue's more recent series of hurricane paintings, begun before Katrina devastated the Gulf Coast. "Every five years, everything changes," Rodrigue says. "I'm affected by life as it goes on around me. In the studio, something happens — I can't sit and paint a happy-eyed Blue Dog when something's going on around me. "When I paint for myself, people say, 'You're gonna lose your audience.' But I've never worried," he contends. "If the paintings are sincere to me, if I care about them so much that I don't want to sell them, people will pick up on it." After Katrina, Rodrigue founded Blue Dog Relief, creating silk-screened recovery-themed images to raise money for his battered home state. So far, he's netted more than $1 million for United Way, the Southeast Chapter of the American Red Cross, the Louisiana Endowment for the Humanities, and the New Orleans Museum of Art. "Right away, $300,000 came in," Rodrigue notes. "A lot of people who lost everything in Katrina wrote in and said, 'This is the first thing I want to buy.'" Lecture with George Rodrigue and his wife Wendy on Sunday, July 29th, at 2 p.m. For more information, go to www.Dixon.org or www.GeorgeRodrigue.com.